Alyssa Carlier | The Devil Orders Takeout: Do Women Really Dominate the Fiction Industry? REALLY? Do Women Really Dominate the Fiction Industry? REALLY? If you take a look around the writing or book blogosphere, it seems that quite a number of us are ladies. I can count the number of boys I know who blog about writing/books on one hand. And a quick look at statistics, men apparently account for only 20% of the fiction market. But do women REALLY dominate the fiction industry? "Unlike the gods of the literary establishment who remain predominately male—both as writers and critics—their humble readers are overwhelmingly female." To me, that does not sound like ladies dominate the industry. In this post, I'll point out three different phenomena that refute the idea men have less power in fiction. Note: In this blog post, I will primarily discuss the differences between men and women in the fiction industry. However, please don't take this to be erasure of intersex or genderqueer people or anyone at all. More than anyone, your voices have been ignored and need to be heard. Another note: books of this genre per se are fabulous and I mean absolutely zero criticism towards them in my argument. Women's fiction is an umbrella term for women centered books that focus on women's life experience that are marketed to female readers, and includes many mainstream novels. Sounds reasonable so far! (so far.) So, how does it differ from men's fiction? Wait, what do you mean, that doesn't exist? How many times have you heard something along the lines of “Boys may like The Hunger Games, even if it is about a girl“? Why is it so taboo for boys to read about girls? Why is it that we have to label "women's fiction" on purpose? Doesn't it, in some way, imply that "men's fiction" is basically all other fiction? Psst, I'm like totally not the first person to spot this. If you don't trust my takeout, the Guardian said it too. Let's think of a few random professionals. (No, bear with me.) Actors, salesmen, waiters, chairmen ... all mankind has denoted males to be the default. But, Alyssa, you say, that's how the language evolved. We're not sexist anymore! Why are Mary Sues female by default? Why are idealised and ridiculously powerful women seen as badly written characters? Come on, the term is mostly used for teen fanfic writers, who are probably not experts in all things writing. And as the linked example above says, Spiderman and Batman are idealised as well. Those franchises are still around. Even when we speak of Canon Sues, the women are singled out more. Bella Swan. Anastasia Steele. I mean, would someone please point out that Christian Grey fairly Sue-ish too? He is so idealised. He doesn't even do any work for his own company, but hasn't gone bankrupt. He's like Donald Trump, but worse. This is the last point I'll have (but definitely not the last point that exists), and I also think it's the most powerful. For those who thought my linking around was not good enough proof, let me give you some stats. An author, Catherine Nichols, was querying agents. Out of 50 queries, she had two manuscript requests. Now, rejection's a necessary part of being an author, but then Catherine tried this scheme (which she herself called dishonest, but I call necessary for science, because that's how I roll) where she sent it out under a man's name. "George Leyer" aka Catherine had 17 manuscript requests out of 50 queries. In other words, George aka Catherine wrote the same book 8.5 times better than Catherine as herself. Another interesting fact from the article: Catherine's rejections praised her beautiful writing. Yay! But George's rejection praised his work for being clever and well-constructed, not the aesthetic of his words. What, like women don't write clever and well-constructed and beautiful words? This isn't a matter of blaming literary agents or industry professionals or anyone. The fact remains that there is unconscious bias against women, and just because we happen to be the many in this industry, doesn't mean we are the more powerful. 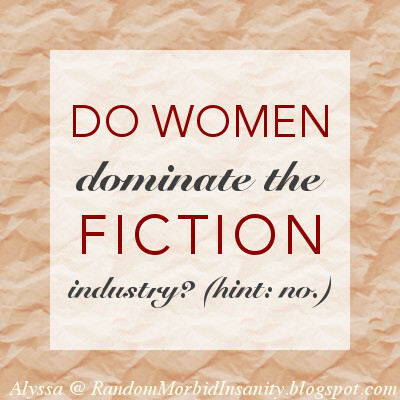 So, my answer to whether women dominate the fiction industry? No. So, do you agree with me? Why or why not? 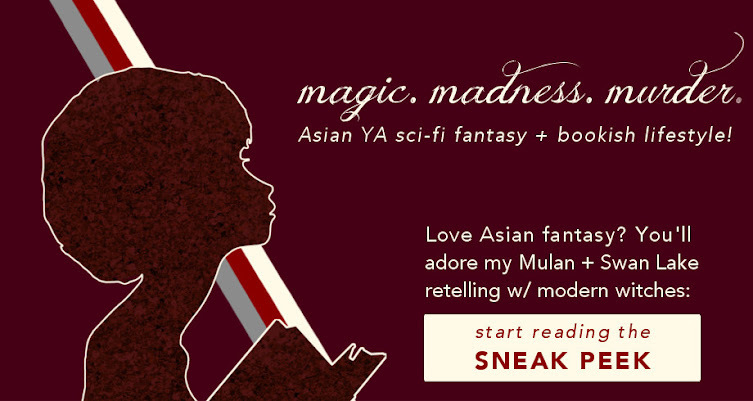 Also, thoughts on the new blog layout? Hey, you might not know this, but I send exclusive monthly content to my takeout army. Join us now to receive monthly letters of more feminism + magic, madness, and murder!